Matt Sharp is the co-founder and president of Causely, a tool that helps local brick-and-mortar businesses generate social media referrals while at the same time supporting some really great non-profit organizations. 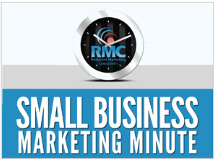 He recently was my guest on the Small Business Marketing Minute podcast to explain how the tool works and what benefits businesses get from using it. Local business owners know and understand that getting current customers to refer new customers is really important, but often struggle to find ways to encourage people to make those referrals without sounding like they’re desperate and begging for help. Offering people monetary incentives to refer new customers often has mixed results at best, and FTC rules prohibit businesses from paying customers to leave positive reviews online (although some do it anyway). Nonprofit organizations are constantly looking for ways to get their supporters to give more money, but at the same time understand that people only have so much money they can give away. When it comes to getting support from local businesses in the form of a sponsorship, nonprofits often find it difficult to give any real benefit to the business in return, other than slapping a logo on the back of a T-shirt. Causely solves both of those problems at once by allowing businesses to automatically donate money to a non-profit organization every time a customer checks in at their location on social media. This makes it possible for a business to support a good cause in a way that actually benefits them beyond simply creating good will among their customers. When customers check in at the business on social media, they are essentially giving an implied referral to all of their friends on that social media platform. As Matt explains in our interview, customers will often add a nice quote or two about the business when they check in, which adds even more value. However, because the business’s donation is based on act of checking in and not on whether or not someone makes a positive statement about the business, there isn’t a conflict with FTC rules about incentivizing testimonials. Use the player below to listen to my interview with Matt and learn all about how Causely works and the results that it is achieving for local businesses.